Plaça de Sant Jaume, roughly the site of Roman Barcino's forum, is the political headquarters of Catalonia today. Eying each other warily across the square are the Ajuntament, Barcelona's city hall, and the Generalitat, the home of Catalonia's regional government and headquarters of the current independence from Spain movement. Created by Jaume I in 1249, the first Generalitat was made up of representatives of the three Estates (Church, military and civilian), and in 1359 it assumed fiscal responsibility for the realm, making it the first parliament on the Iberian peninsula with real clout. The current palace, made out of several Gothic mansions, was adapted in the early 1400s to give the Generalitat a permanent seat. Its Roman Renaissance-style façade was added in 1617, complete with a statue of Catalonia's patron St Jordi by Andreu Aleu. When Philip V abolished it in 1714, the palace became seat of his Reial Audiencia, which rubber-stamped Madrid’s policies. But such is the Catalan virtue of continuitat that no one ever forgot the real Generalitat. 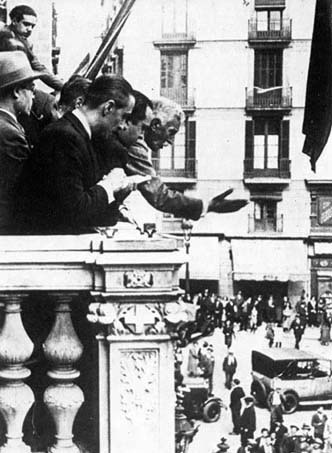 In April 1931, it once again became the seat of the autonomous Catalan government. Franco abolished it, but since 1977 the building has once again resumed its function— not something many secular medieval buildings get to do. Current occupant Artur Mas i Gavarro is the 129th president since 1359. The older façade, facing C/ del Bisbe Irurita (the main street of Roman Barcino) was designed in 1416 by Marc Safont and has some of the best gargoyles and modillions in Barcelona, topped by a superb rondel of Sant Jordi by Pere Joan, a work that so pleased the Generalitat that they paid the sculptor double the agreed price. The street passes under a picturesque Bridge of Sighs, a much maligned pseudo-Gothic touch added in 1928, when the city was busily rediscovering its roots. 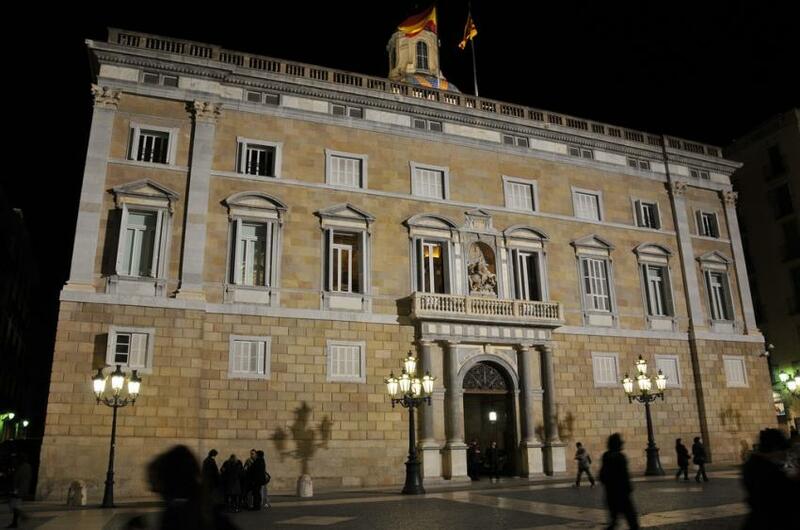 Today the only sighs are exhaled by the Catalan President as he leaves his official residence, the 16th-century Casa de los Canónigos (the former canons’ house), on his way to work in the Generalitat. You have to make a special effort to get inside (see below), but it's worth it. The Generalitat's Gothic courtyard is especially lovely; a carved exterior stair ascends on a daring stone arch to a colonnade gallery with the slimmest of columns. The whole is crowned with pinnacles and gargoyles that for the world look like medieval Barcelonans. The chapel is entered by way of Marc Safont’s Gothic portal (1436), flamboyant, vertical and ornate in a town that usually prefers its Gothic unadorned and broad in the beam. This, of course, is dedicated to Catalonia’s patron, Sant Jordi. The chapel’s magnificent altarpiece of 1451, now hanging on the wall, shows George and the dragon in a landscape littered with leftovers from previous meals, all stitched in gold and silver thread. On the altar is a handsome silver statue of Sant Jordi (1430) in articulated Milanese armour, tickling a baby crocodile of a dragon with his lance. When the Generalitat was enlarged in 1526, it was given its orange-tree courtyard, the Pati dels Tarrongers and beyond that the ceremonial Golden Room, named for its remarkable 16th-century gilt ceiling. Here Flemish tapestries on the triumphs of Petrarch replace the Noucentista frescoes by Torres Garcia, which fell out of favour in the Primo de Rivera dictatorship (his detached works are now displayed in another room). The president and his ministers meet in the Sala Antoni Tàpies, with a painting by that artist based on the four medieval chronicles of Catalonia. A plaque commemorates the return of president-in-exile Tarradellas from France on 23 October 1977 (‘Ja sóc aquí!’ – ‘Here I am!’ – were his famous words, which he repeated so often that it became a joke). The Generalitat is also proud of its 49-bell carillon, which is played weekdays at 12 and 6pm, and occasionally on Saturday noon. There are often full concerts on the first Sunday of the month at noon—you'll hear it all over the neighborhood. Hours Open 23 April (St George's Day), 11 September (Catalan National Day) and 24 September (Feast day of La Mercè).